Snow Plough Forklift Attachment: Prepare For The Winter Months Now! Summer is over and autumn is upon us, which means that the cold winter months are on their way. If the last few winters are anything to go by, this winter looks set to deliver snow and icy conditions. Failure to prepare for these conditions may result in loss of income and a waste of valuable time and resources. Now is the time to get organised and we have the ideal, cost effective solution with our snow plough forklift attachment. Icy conditions outside your premises can be a health hazard to your employees, whilst there is the possible that unpredicted snow fall may result in your premises being snowed in, meaning you are unable to take deliveries and distribute orders. However it does not have to be like this. Historically, in order to remove snow or ice from your premises, you would have to assign members of your workforce to the laborious chore of physically removing it. Now this is not the case. By equipping your workforce with the snow plough forklift attachment, you will easily be able to handle the worst weather the winter throws at you. In addition, utilising this attachment reduces unnecessary disruptions to your business, enabling your concern to continue to function at full productivity throughout the winter months. Safety – In the form of impact protection. This is achieved through the flexible polyethylene dish which is bolted onto the attachment providing safety and security to the operator, forklift, the surface in question and the plough itself. Versatility – With this attachment, operators are easily able to plough snow and icy detritus to either the left hand side or the right hand side. In order to change plough direction, simply remove the plough, turn it over and reattach. Durability – This is provided through the inclusion of galvanised fixed angle body with zinc plated “T” bolts in the design. 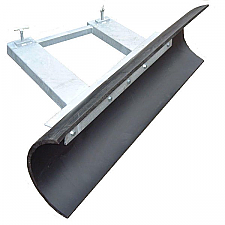 Efficiency – The plough is constructed from high quality polyethylene, as it has been scientifically proven that snow flows off this material more easily than off steel and other metals. Flexibility – Using polyethylene means that the attachment will not become permanently dented upon an impact. Reliability – The dish itself is removable and replaceable and due to being constructed from polyethylene, it will not rust, providing longevity. This entry was posted in Handling Equipment and tagged snow plough forklift attachment on October 4, 2013 by admin.